The master colorizer Benoit Vienne brings to life the process of turning a black & white image into living color with Qantas’s first 707 in 1959. In this photo are Boeing and Qantas executives and their wives about to board the first delivery flight to Australia in July 1959. At the extreme left is Bill Allen Chairman of Boeing and at fifth from right is Hudson Fysh, co-founder of Qantas. When the jet era dawned Qantas management considered a variety of options including buying an interim type, such as the turbo-prop powered Bristol Britannia, while it waited for the development of more powerful jet engines. It even came close to buying a package of piston-engine Douglas DC-7Cs and DC-8 jets but the short range of the early jets was an issue. Boeing was more innovative than Douglas, which is now part of Boeing, and offered Qantas a shortened version of the 707, with more powerful engines, and thus greater range, a for delivery in May, 1959. 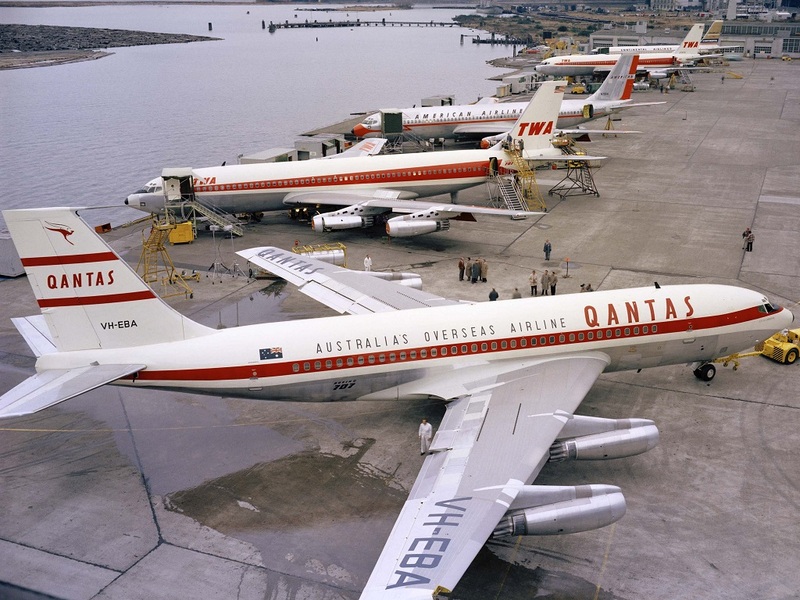 On September 6, 1956, the government announced that Qantas would buy seven Boeing 707-138s worth $28 million. A Qantas press release at the time said that the 707-138s would cut the flying time on the Kangaroo Route from 48 hours to just 27 hours, a hugely attractive prospect to its passengers. Qantas Boeing 707s entered service on the Pacific route on 29 July 1959 and this was extended to London on 5 September. On October 15, 707-138s were introduced on the Kangaroo Route and Qantas became the first airline to circle the world with jets. With the jets came a host of new technology which cut crew costs. Radio operators were made redundant by more sophisticated VHF and HF communications. The periscope for the navigator to take sun and star sightings on the first 707s quickly became obsolete with the introduction of Doppler Radar and the Inertial Navigation System (INS).